I’ve just finished a great book Hanging Kokedama by Coraleigh Parker and have been inspired to make as many Kokedama as I can! (If you don’t know about kokedama, check out my book review) However, I wanted a way to hang them all together that would look as rustic as the plants. That’s when the idea for my Hanging Kokedama Mobile popped up! Keep reading to find out how to make your own. First step is to make the kokedama. Take one of the succulents and place it on top of a mound of moss. Move the moss around so that it comes up to cover all of the soil to the base of the plant. Take the cotton thread and start to wrap it tightly all around the moss. 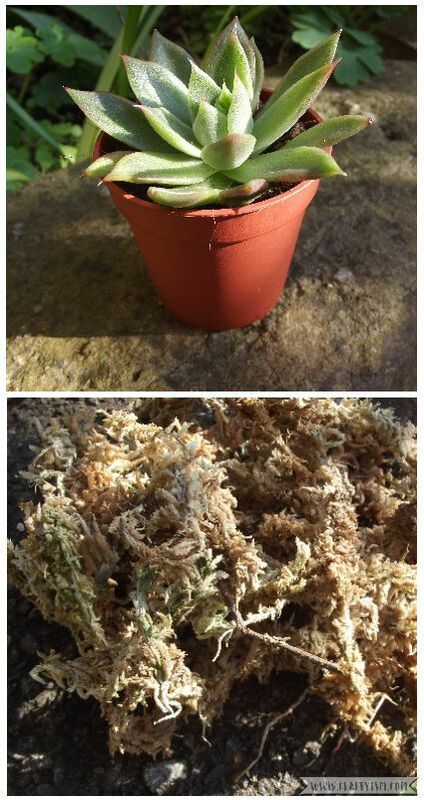 Keep wrapping the thread until the moss is tightly bound in a ball shape around the base of the plant. When you’ve finished, tie the thread to secure. Repeat with the other two plants so that you have a group of three kokedama. Take a long length of cotton and tie one end to the threads at the top of the kokedama plant. Make a large loop by taking the thread over the top of the plant and tying on the free end of the cotton opposite the other end. Take your branch or driftwood and using the small dill bit, make three holes in the middle section of the stick, equal distance apart. Using a larger drill bit, the same width as your rope, make a hole at each end of the stick. Using the stick as a guide, decide how much you want your mobile to hang and cut a length of rope to match. Thread one end through a large hole and tie a strong knot. Thread the other end through the remaining large hole, and again tie a knot. Pull the rope so that the knots lie against the stick. Place your kokedama under the stick and arrange them in line with the three small holes. You may need to shorten or lengthen some of the plant’s hanging loops until you like the look of the group. Thread the top of one of the hanging loops onto the needle. Pass the needle up from the bottom of the stick, through a small hole, to the top of the stick. Put a bead onto the needle and pull it onto the thread. Remove the needle and tie a large knot at the top of the thread. Pull the thread so that the bead sits against the stick. Repeat steps 4 and 5 with the other two kokedama. Your Hanging Kokedama Mobile is now finished! Hang it by the rope loop in a sunny spot and admire your handiwork! To keep your kokedama alive, dunk it in a shallow bowl of water. If it doesn’t float, it doesn’t need watering yet. Succulents and cacti don’t need as much water as other plants. If you liked this tutorial I really think you’ll enjoy Hanging Kokedama by Coraleigh Parker where you can learn how to make kokedama out of all sorts of different plants. I think I’m going to display my Hanging Kokedama Mobile by my Moss Ball Turtle and Mason Jar Tree Terrarium. I like the idea of having a plant corner in every room! 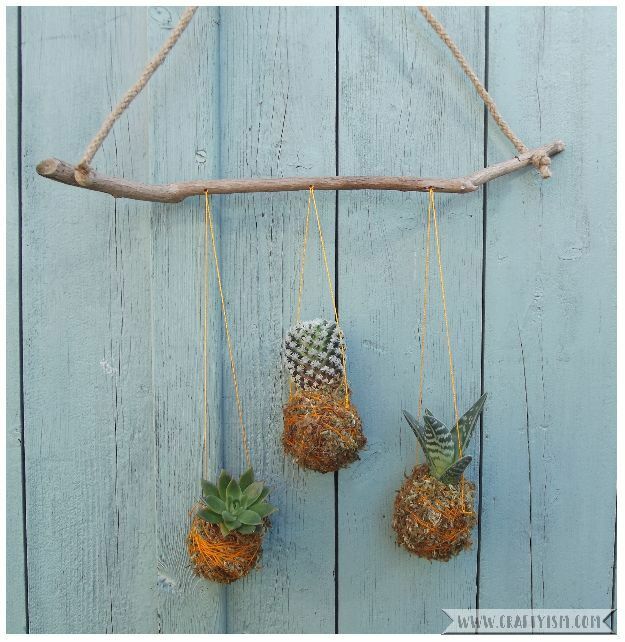 Where would you display your Hanging Kokedama Mobile?